The corporation has become the core institution of the modern world. Designed to seek profit and power, it has pursued both with endless tenacity, steadily bending the framework of law and even challenging the sovereign status of the state. After selling his successful computer book publishing business to a large corporation, Ted Nace felt increasingly driven to find answers to questions about where the corporation came from, how it got so much power, and where it is going. 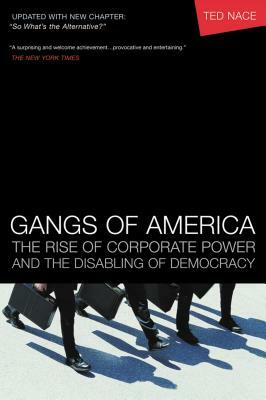 In Gangs of America he details the rise of corporate power in America through a series of fascinating stories, each organized around a different facet of the central question: “How did corporations get more rights than people?” Nace traces the events and people that have shaped the modern corporation to give us a fascinating look into the rise of corporate power. While working for the u.s. forest service during high school, Ted Nace learned about the plans of several major corporations to develop coal strip mines and other energy projects near his hometown of Dickinson, North Dakota. During graduate school, Nace worked for the Environmental Defense Fund, where he helped develop computerized simulations that demonstrated the investor and ratepayer benefits of re- placing coal-fired power plants with alternative energy programs. The EDF simulations led to the cancellation of a multi-billion-dollar coal- based power complex proposed by two California utilities. After completing his graduate studies, Nace worked for the Dakota Resource Council, a citizens’ group concerned about the impacts of energy development on agriculture and rural communities. —John Stauber, coauthor of Toxic Sludge Is Good for You!